Pencils for the office, school, or just someone who loses their pencils a lot can get pricey, fortunately there are a lot of inexpensive options out there. But are they even worth it to try? Sure, there are a lot of inexpensive pencils, but if they don’t “pencil” there is no reason to even consider them. 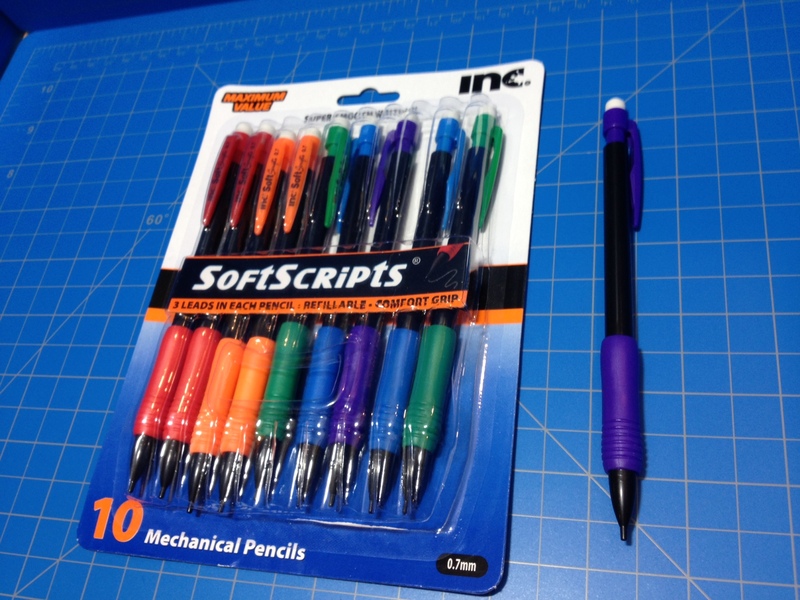 INC Soft Scripts are one such pencil on the less expensive side of the aisle. How well do they work? The design here is pretty stereotypical, with the barrel being a thin, featureless tube of black plastic that tapers at one end to a plastic lead pipe. 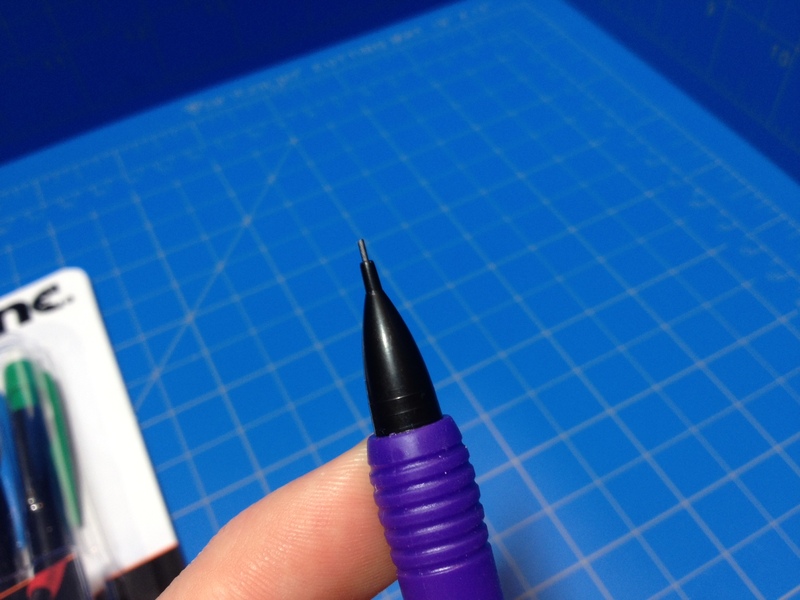 Near this end is a rubber grip in one of a few (5 in my case) colors that is narrower in the middle and has ridges toward the end, both ostensibly to help with grip, and they succeed in being barely noticeable. On the back end is a colored plastic push-advance mechanism (that matches the grip) with integrated pocket clip and eraser holder. This bit can be removed to expose the lead-holding tube that contains 2 extra leads (for a total of 3 per pencil). The clip is nothing spectacular, with most of the necessary information on it, and fairly brittle. But I feel the entire end piece would fling off before it broke. Performance is what one would expect. The HB lead is middle-of-the-road, leaning toward soft, but there’s nothing particularly off about it. I personally don’t use a .7mm size but it is a fairly standard size and makes breaking less of a problem. The eraser is one of the little white ones that will get the erasing done pretty well, but will seem to disappear almost immediately. The clip is serviceable but I wouldn’t recommend using it. And, finally, the mechanism is quite solid and workable; pushing lead out and holding it in place when commanded to do so. 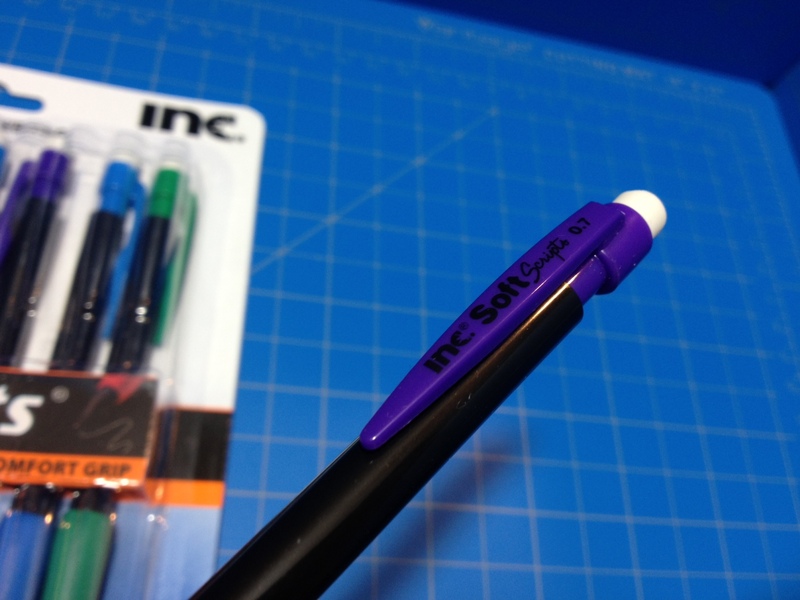 They’re easily usable, but far from spectacular, pencils, with their main benefits being the rubber grip (if you happen to like those) and the fact that they are the ones at the store (if indeed they are the ones at the store). There’s nothing really there to recommend them on, but no reason to tell you to stay away, either. They will perform fine for office, school, car, or other tasks where pencils should be inexpensive because of the frequency with which they are broken or lost. In comparison to others at a similar, price it would really come down to personal preference.